We've been fans of Logitech's webcams for years, and this latest model still manages to impress. The build quality and styling of the Logitech QuickCam Vision Pro are superb, with nice design touches such as the light that lets you know the camera is active showing as a smart white ring around the Logitech logo. The mount is intelligent, too, happily hooking over a desktop monitor or laptop screen, or sitting on a flat surface. Picture quality is fantastic. The lens is autofocus, and it reacts reasonably quickly to objects moving close to and far away from it. It also does a cracking job of dealing with problematic lighting; one test in which cheap webcams always do poorly is low light. Usually, we'd expect to see pictures that were either very dim or hampered with unacceptable levels of noise. 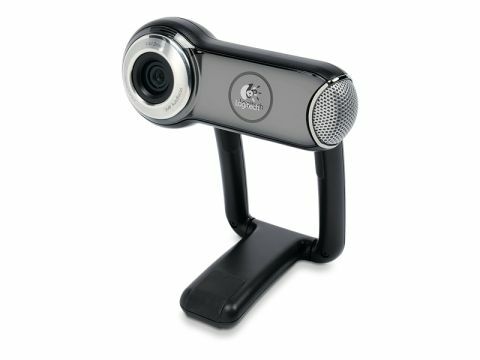 The Logitech QuickCam Vision Pro does very well in low light, however, producing images that are more balanced and detailed than we're used to seeing in webcams that cost half as much. Audio, however, isn't as accomplished as we've seen from earlier Logitech webcams. There's an annoying amount of background buzz, and it tends to pick up ambient noise far more then we'd like; when we tried to use it to talk to folks on iChat from the office, they complained about being able to hear our colleagues in the background. No software is supplied, but that's fine as it happily works with iChat, Skype and Photo Booth; indeed, it should work as a video input for any modern software. Though it's a two-megapixel camera, there's no way of capturing stills at full resolution without investing in a third-party piece of software. Despite the disappointingly-indiscriminate microphone, this is still a great webcam, and it's definitely worth paying a little more for a good one.